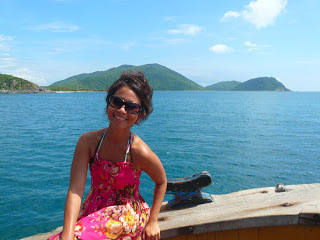 Taking a day boat trip was one of the best ways to explore islands around Nha Trang. I looked at my guide book to check the most credible boat trip organizer and wrote the name’s down. Fortunately, the hotel where I stayed, had a collaboration with that tour agent, so they booked everything for us. 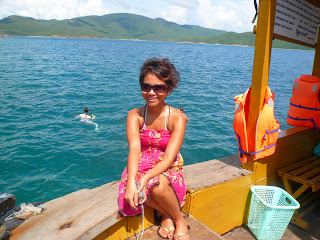 It’s called “Mama Linh’s Boat Tours”. Well, I have to admit that taking a boat trip is a very touristy thing. Hehehe… 90% of the people on that boat were tourists! Mostly Westeners – British, Australian, American, Swiss, German, Dutch, etc. I was the only Indonesian and there were around 5 Vietnamese joining the tour, too. The tour guide was a local guy with a good sense of humor. He was so funny and has successfully entertained everyone on the boat. Usually I put on my ipod everywhere I’m in a public transport, but not this time. I enjoyed listening to his dry humor and “performance”. When you take a boat trip, don’t forget to bring these items: bikini/swim wear, sunglasses, sun lotion, towel/sarong and a pair of flip-flops :), because you’re gonna swim A LOT in the sea, in between the islands… so cool!!! First destination was to Hon Mun (or Mun Island/Salangane Island/Ebony Island… geez.. how many names they need to call an island???). This island is famous for its snorkeling. And, of course, I snorkeled too! (no scuba-dive, but at least I gotta chance to say hi to Vietnamese fish! :D). The water was very clear. I could see the beautiful corals 7m under, easily. Very nice. Those different types of corals are well-protected and in a good shape. I saw a lot of fish, too. Some of them have nice colors: purple, blue, yellow, in gradation. Awesome. 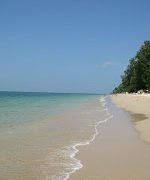 I spent an hour snorkeling there… enjoying the sea life down there… I could stay here forever, if the Mama Linh’s staff didn’t scream, “Hey.. Indonesia! Get on the boat! !” Hahaha.. crazy dude. Next destination was to Hon Mot (Mot Island). It is also another spot for snorkeling, but this time, we didn’t snorkel, instead, we had lunch here! The Mama Linh’s staffs were so well prepared. 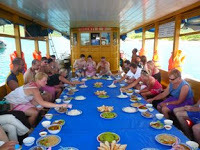 They turned the boat into a big dining hall and served some dishes for everyone! The menu was: spring rolls, ragout with French bread (aha! ), fried noodles (of course, you’re in Asia! ), rice (of course! ), fried pork, fried vegetables and seafood soup. Since I’m vegetarian, I could only eat the spring rolls and fried noodles with a bit of vegetables. It’s fine, am used to it. Anyway, the scenery surrounds me was just so beautiful, so I didn’t have time to complain about the “non-vegetarian-friendly” lunch menu! Hehehe.. This is my favorite… and I would never imagine it before… having a glass of wine in a plastic cup on the sea.. 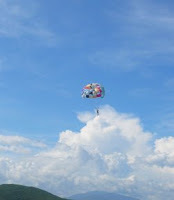 floating!! It was sooooo odd, yet fun!!! Can you imagine, drinking wine from a floating bar, in the middle of nowhere, floating on a rubber ban with beautiful landscape surrounds you? Oh, how cool is that??!! When the “happy hour” ended, all of us got on the boat again and continued our trip. Me and Danny decided to order a bottle of vodka and two cans of soda and continued drinking with the rest. The vodka was so cheap. The cheapest vodka I’ve ever had in my life: 2 Euros/ bottle! It’s a local brand, but don’t ask… it’s pretty strong! We shared the bottle with several people on the boat, while sunbathing on the deck. Fun!!! We spent about an hour on the island and I just laid on the beach and fell asleep! The beach is a bit rocky, so I had to find the best spot to lay on my beach sarong and sunbath. Hehehe… It was very relaxing… Really. 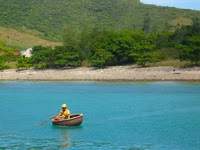 The last destination was to Hon Mieu (Mieu Island aka Tri Nguyen Island). There is an outdoor aquarium where you can see tropical fish and shark. But, guess what.. I passed out on the boat and I didn’t remember a thing about this island! Hahahaha… (yeah yeah… feel free to laugh at me!). Danny told me that some people stayed on the boat, too. Too tired probably. 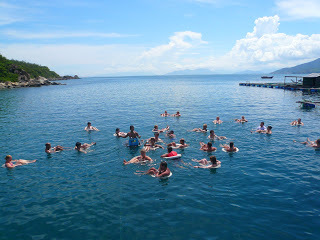 Some of them continued swimming on the sea as the water was very refreshing. And ohh.. I always love swimming in the sea coz it feels like swimming in a giant swimming pool :). Cool. 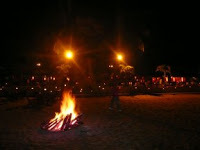 The best place to hangout in Nha Trang is the Sailing Club. During the day, it’s a restaurant, indoor and outdoor. You can have lunch on the beach too as they have nice deckchairs by the beach. In the evening, the left side of the place turns into a club, with some comfortable sofas and a dance floor. The bar looks stylish in red with fish tiles as decoration. Fancy. You wouldn’t believe how cheap the drinks here! It’s the hippest club in town, but the drinks cost nothing! 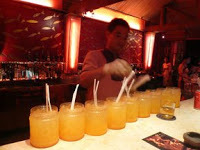 A single mixed cocktails only costs 20,000 VND. And this is the best deal: a cocktail bucket, 650 ml, costs 40,000 VND!!! You can choose your own liquor, from vodka, rum, martini, anything. Good deal, huh? No wonder people got so drunk in the end. Hahaha… How come the drinks are cheap? The bartender showed me the bottle of local vodka. Aha! That’s the secret! 😉 Those evil local liquors!!! Asyik yaaa bisa jalan2…trus rencananya dalam waktu dekat mau jalan ke mana lg niiih?? Bravoo , Nice things and Pics . Would U send me a few other nice one,s . @nahria medina: haiiiiiii… thanks ya udah mampir2x ke blog ku :). @anonymous: thx for your compliment. 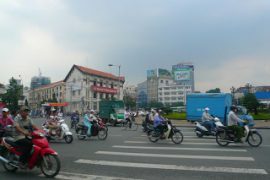 do you need more pix of hcmc and nha trang? I am not surprised you got ‘tipsy’ drinking wine from a floating bar! Lha itu sertifikat PADI nganggur berapa lama…kirain nyelem! Next blog nyelem ya! Lihat foto2nya kok kayaknya mubazir ngga nyilem…hehehe. Floating bar is a good concept. 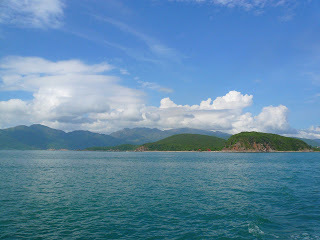 hi nila, how to get to Nha trang? did u start from ho chi minh? Tx nila. @kurniawan: I’ve never been to Bunaken yet.. but for diving, Bunaken is considered as one of the best diving spots in the world ;). @anonymous: I took a local plane from Ho Chi Minh City to Cam Ranh airport. The journey only took 50 minutes.